Monomoy Stables, Michael Dubb, The Elkstone Group and Bethlehem Stables’ Monomoy Girl has been installed as the 4-5 favorite in a field of seven 3-year-old fillies entered for Saturday’s 81st running of the $500,000 Central Bank Ashland (G1) at Keeneland. The 1 1/16-mile main track test offers 170 points toward the $1 million Kentucky Oaks (G1) to be run May 4 at Churchill Downs with 100 going to the winner, 40 to the runner-up, 20 to third place and 10 to fourth. The Oaks is limited to the top 14 point earners that pass the entry box and currently the cut line is 21 points. The Central Bank Ashland, one of five graded stakes races Saturday, will go as the ninth race on the 11-race program with a 5:45 p.m. ET post time. First post time Saturday is 1:05 p.m. Trained by Brad Cox and to be ridden by Florent Geroux, Monomoy Girl has won four of five career starts. In her lone 2018 outing, she won the Rachel Alexandra (G2) at Fair Grounds on Feb. 17. Monomoy Girl’s only defeat was a runner-up finish by a neck in the Golden Rod (G2) in November at Churchill Downs. Monomoy Girl will break from post position one. Second choice on the morning line at 2-1 is Magdalena Racing, Gainesway Stable and Harold Lerner’s Eskimo Kisses. Runner-up in the TwinSpires Fair Grounds Oaks (G2) in her most recent start on March 24, Eskimo Kisses will break from post position two. She is trained by two-time Central Bank Ashland winner Kenny McPeek and will be ridden by Corey Lanerie. Lanerie is one of five riders to have won the Central Bank Ashland three times. A victory Saturday would make him the first to win the race in three consecutive years. Lanerie won with Hooh Why in 2009,Weep No More in 2016 and Sailor’s Valentine in 2017. Other graded stakes winners in the field include Craig Upham’s Patrona Margarita and Don Alberto Corp.’s Andina Del Sur. Trained by Bret Calhoun, Patrona Margarita won the Pocahontas (G2) in September at Churchill and did not return to the races until February when she finished fourth behind Monomoy Girl in the Rachel Alexandra. Patrona Margarita will be ridden by Brian Hernandez Jr. and break from post position three. Trained by Tom Albertrani, Andina Del Sur will be making her main track debut Saturday. Winner of the Florida Oaks (G3) in her most recent start, Andina Del Sur has raced exclusively on turf in her four-race career. Julien Leparoux has the mount and will break from post position five. The field for the Central Bank Ashland, with riders and morning-line odds, from the rail out is: Monomoy Girl (Geroux, 4-5), Eskimo Kisses (Lanerie, 2-1), Patrona Margarita (Hernandez Jr., 15-1), C. S.Incharge (Luis Saez, 10-1), Andina Del Sur (Leparoux, 6-1), Ipanema Beach (Chris Landeros, 20-1) and Tyfosha (Irad Ortiz Jr., 15-1). All starters will carry 121 pounds. Betting at Keeneland or on the Kentucky Derby? See what goes into setting the odds. Man studying racing paper trackside before races. Source: Betting at Keeneland or on the Kentucky Derby? See what goes into setting the odds. Keeneland will launch a new Twitter handle for the 2017 Fall Meet, @BetKeeneland, dedicated to providing on-demand content to horseplayers and a Handicapper of the Day series featuring a unique benevolent aspect benefitting the Permanently Disabled Jockeys Fund (PDJF). 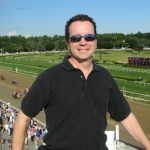 Among the nationally prominent handicappers set to participate as a guest handicapper are NBC Sports’ Bob Neumeier, ESPN College Game Day’s Chris Fallica, Daily Racing Form’s Marty McGee and Byron King, TVG and Horseplayernow.com’s Caton Bredar and SiriusXM at the Races’ Steve Byk. Keeneland will provide each Handicapper of the Day with a $200 bankroll to wager over the course of the race day, with winnings going to support PDJF. “The PDJF appreciates the support of Keeneland and all of the handicappers in this series, which is part of the great racing program Keeneland produces,” PDJF President Nancy LaSala said. Another feature of @BetKeeneland will be the Keeneland NOW Podcast, with noted handicapper Jeremy Plonk of Horseplayernow.com. In this podcast, lasting 60-90 seconds, Plonk will offer final thoughts 10 minutes prior to every race. Plonk also will be on call to field questions from fans in addition to providing traditional tweets and commentary throughout the race day. The 30-minute race-day Preview Podcast that airs live at Keeneland.com each race day from noon-12:30 p.m. will be available at @BetKeeneland. The @BetKeeneland handle is a valuable resource for handicapping Keeneland’s Fall Meet. 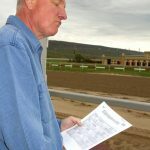 The Twitter feed also will provide scratches, changes, clocker reports, track conditions, race results, expert picks and carryover information. Keeneland’s Fall Meet begins Friday, Oct. 6, and runs through Saturday, Oct. 28, with racing Wednesday through Sunday. Post time for the first race daily is 1:05 p.m. ET. Keeneland’s 2017 Fall Meet, which covers 17 days from Oct. 6-28, will present six Grade 1 races among 17 graded stakes worth $5.325 million and will showcase many of the nation’s top contenders aiming for the Breeders’ Cup World Championships during its signature Fall Stars Weekend on the first three days of the season. Among the most prestigious race meets in the country, Keeneland’s Fall Meet offers one of the richest purse structures in North America and attracts Thoroughbred racing’s equine and human stars. Fall Stars Weekend will feature nine graded stakes, including five Grade 1 events anchored by the $1 million Shadwell Turf Mile (G1) that are worth a total of $3.75 million. Eight of those stakes, including the $400,000 First Lady (G1) for the first time, are Breeders’ Cup Challenge “Win and You’re In” races that award the winners automatic berths in the Breeders’ Cup, to be held at Del Mar on Nov. 3-4. A total of nine Keeneland Fall Meet stakes are Breeders’ Cup Challenge events. The eight Breeders’ Cup Challenge stakes held over Fall Stars Weekend are the $400,000 Darley Alcibiades (G1) (which awards the winner a berth in the Juvenile Fillies-G1) and $250,000 Stoll Keenon Ogden Phoenix (G2) (TwinSpires Sprint-G1) on Friday, Oct. 6; Shadwell Turf Mile (Mile-G1), $500,000 Claiborne Breeders’ Futurity (G1) (Sentient Jet Juvenile-G1), First Lady (Filly and Mare Turf-G1) and $250,000 Thoroughbred Club of America (G2) (Filly and Mare Sprint-G1) on Saturday, Oct. 7; and $500,000 Juddmonte Spinster (G1) (Distaff-G1) and $250,000 Dixiana Bourbon (G3) (Juvenile Turf-G1) on Sunday, Oct. 8. The other graded stakes during Fall Stars Weekend, also being run Oct. 7, is the $200,000 Woodford (G2) Presented by Keeneland Select, upgraded for 2017 by the American Graded Stakes Committee of the Thoroughbred Owners and Breeders Association. Keeneland added $50,000 to the purse of the Woodford, formerly a Grade 3 race. The ninth Breeders’ Cup Challenge race at Keeneland is the $150,000 JPMorgan Chase Jessamine (G3) on Wednesday, Oct. 11. The race awards the winner a spot in the starting gate for the Breeders’ Cup Juvenile Fillies Turf (G1). The Fall Meet’s sixth Grade 1 stakes, scheduled for Oct. 14, the second Saturday of the season, is the internationally prestigious $500,000 Queen Elizabeth II Challenge Cup Presented by Lane’s End for 3-year-old fillies at 1 1/8 miles on the turf. 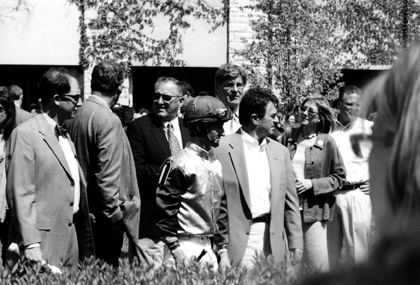 In the storied history of Keeneland Race Course, many patrons have had memorable (and profitable) weekends. We would venture to guess, however, that not many have equaled the weekend that Blaise Brucato just experienced at this venerable racetrack. Roughly 24 hours after winning the inaugural Keeneland Spring Challenge, a $400 buy-in tournament held on Saturday (4/22/17), Blaise topped that performance with a dramatic win in Keeneland’s Grade One Gamble, a $3,000 buy-in tournament that has become one of the most prized titles on the NHC Tour. On Saturday, the Cleveland native bested a field of 258 players by hitting a $500 exacta on the last race, winning a $10,000 BCBC spot and $3,500 in cash. Mike Maloney of Lexington captured 2nd and 4th places in the tourney, earning an NHC spot and $3,500 in prize money. NHC qualifiers Paul Hoffman of Chicago (3rd place) and Mark Haidar of Northville, (5th place) joined lucky 6th place finisher Ali Aksoy of Toronto, who benefitted from the NHC rule that prohibits any player from scoring 2 NHC spots in one tournament. [AGOS Founder Rich Nilsen finished a distant 21st]. After winning the Saturday tournament, Blaise revealed that April 22 was his Dad’s birthday. 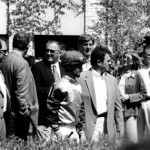 Bill Brucato introduced his son to horse racing at a young age, and even though Bill passed away in 1988, it is clear that his spirit and love for racing lives on through Blaise. The incredible story continued on Sunday, as Brucato closed again in the final race, cashing a $250 exacta to vault past former NHC Tour champion Jonathon Kinchen by a mere $200 to claim back-to-back victories, with another BCBC spot, an NHC berth, and $13,000 in cash. 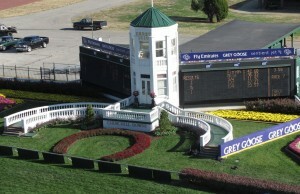 In the Grade One Gamble, a record 170 entries competed for 7 BCBC spots, 10 NHC spots, and over $40,000 in cash prizes. The 2nd place finish by Austin, TX native Kinchen earned him a BCBC and NHC spot plus $6,500 in cash. Third through 7th finishers Bob Traynor of Oceanside, CA, Joe Kramer of Fargo, ND, Marshall Gramm of Memphis, TN, Randy Gallo of Palm Beach Garden, FL and Kenneth King of New York, NY all earned BCBC and NHC entries, in addition to cash prizes. 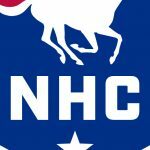 Brian Johnson of Biloxi, MS, Ali Aksoy of Toronto, ON and Mike Maloney of Lexington, KY finished 8th through 10th and earned a berth to the 2018 NHC, in addition to cash prizes. For Aksoy and Mahoney, it was the 2nd NHC berth in as many days. To recap the weekend, totaling his bankroll winnings, cash prizes, and BCBC/NHC berths, Blaise Brucato cashed for over $50,000. Not a bad way to spend a weekend at Keeneland, and not a bad way to celebrate your father’s birthday. Somewhere Bill Brucato has a wide smile on his face. Luis Saez had the call for Todd Pletcher. Trapped on the rail down the lane making his first start in 56 days. Saez tipped off the rail for clear sailing and tried to split runners in the final 1/8th. Green Gratto and Unified slammed the door shut and he didn’t make the gap. An inquiry didn’t help his case, but we saw there was some promise. I think we’ll see big things from this son of Macho Uno this year. Joe Bravo in the irons for Kiaran McLaughlin as they brought this son of War Front to post. – He led all the way and set some pretty quick fractions. Down the lane Bravo tried to take his mount as far as he could and started weaving a bit down the lane. He drifted into the paths of some other runners and the objection sign hit the board. After a few minutes, there was no action taken. “Jersey-Joe” is a 4% winning rider on the turf, and that is not a true reflection of his ability on the sod. I’m looking for the speedster to take em’ to the winner’s circle at a square price. Javier Castellano in the saddle for Arnaud Delacour and they were sandwiched and pinched back badly at the start spotting the field at least 10 lengths. He made an “Arazi-like” move around the far turn making up a quick 15 lengths in a few strides. He began weaving in and out of traffic and his fast closing fourth is a promising sign. Hopefully we’ll see a return in the final days of the meet. Miguel Mena in the saddle for Al Stall. The Fair Grounds shipper is a son of Harlan’s Holiday and was in pretty tight at the 1/4 pole. Once Mena broke free he was beaten by a dirty nose right at the wire. If he comes back this meet go to the windows with both hands ! Jose Ortiz in the saddle for Mike Maker. Two-year-old daughter of Majestic Warrior had been training over the poly at Turfway Park. Her dam My Paige’s Jewel is 1/1 with her poly runners. She saved ground and commenced a bid earning the show spot. Look for her right back at the boutique meeting. Corey Lanerie in the driver’s seat for Phillip Sims. This son of Turtle Bowl was on the class drop and making his bid for the first time in four months. He made a strong move but came up a little leg weary down the lane. They’ll probably target Churchill Downs as he loves the Louisville sod. Bryan Pena had the call and was fresh off the claim for trainer Steve Knapp. She is 6/14 ITM at SA, and was squeezed back at the break costing precious ground. Tyler Baze in the irons fresh off the claim and blinkers off for this run. This son of Tiz Wonderful was making a 2nd start off a one month break and and hopped at the start costing the runner some needed ground. Better things are coming his way next time to the races. Santiago Gonzalez in the saddle making her second start of the year. She usually dukes it out with Cal-bred stakes runners and the welcome drop to maiden special weight looked good. She was forced three wide on the final turn and may have added to the ground she covered. Maybe a better trip is just what the doctor ordered and we’ll have a runner who can make amends for her last race. 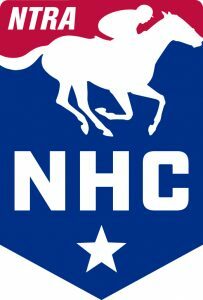 Rich Nilsen, founder of AGameofSkill.com and one of the top tournament players in the history of the NHC, offers up his Spot Play and full-card analysis for Saturday, April 8th at Keeneland. The analysis covers the full card, all 11 races at Keeneland on Saturday 4/8. Nilsen provides selections for the 11 races including the 5 graded stakes on the card. Wagering strategies are included for the 3 spot plays on the Keeneland card. Each race offered includes Nilsen’s detailed pace scenario which explains how the race will set up. Put an expert on your side as you attack Keeneland on Blue Grass Stakes day! Only $9.97 for the full-card Keeneland analysis, incl. 3 spot plays with Wagering Strategies. Nilsen had a huge year in 2016 with his few, major race day selection sheets. One of those days was the 2017 Travers Stakes card won by eventual super horse Arrogate. Arrogate was fairly unknown at the time, which is why he went off at 11-1 for trainer Bob Baffert. 2016 Travers’s Day Recap: Nilsen picks top selection Haveyougoneaway who upsets the G1 Ballerina at odds of 10-1! Nilsen follows that score up by giving out top selection ARROGATE, track-record winner of the G1 Travers Stakes! Arrogate returned $25.40 to win for followers of the sheet. Another top pick runs 2nd at odds of 17-1 in race 3 on August 27, 2016. “Great job, Rich!” ~ Jeff S.
“Rich: Nice job Travers Day! Thanks to Arrogate, you gave me a good day. How in the world did you land on him? I suspect you’re doing some kind of voodoo pace analysis. If you ever decide to give lessons or a seminar, let me know.” ~ Kelley S.
When one combines these categories, it accounts for close to 70% of Asmussen’s wins. The 51 year old trainer comes from a racing family in Texas, which includes his brother Cash who won an Eclipse Award and then enjoyed a successful career in Europe. Steven Asmussen has won several of the country’s great races. His biggest wins have been the Preakness, Breeders’ Cup Classic and the Dubai World Cup. 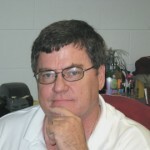 He has also won the Eclipse Award as the most Outstanding Trainer. Asmussen wins with a variety of angles but is very dangerous with his two year olds in their first start and he excels with second time starts of any age. The same can be said of his layoff horses, either first or second race back. When one combines these categories, it accounts for close to 70% of Asmussen’s wins. The trainer pretty much works his horses 6-7 days apart and most of his winners have their last work 6-8 days prior to race day. One should look for a gate work from his debut juveniles, usually in one of the last two workouts before race day. The last work for a two year old will come at Keeneland. Of particular note is, that compared to most trainers, Asmussen has his horses working a little more in a 30 days period leading up to race day. He will have 15 furlongs of racing or work at a minimum and often his horses will go more than 20 furlongs within a 30-day period prior to race day. The trainer rarely produces a repeat winner at Keeneland. Asmussen, surprisingly, delivers with some ‘price’ horses at Keeneland and approximately two-thirds of his Keeneland victories have come in the fall meet. He will ship horses from many different tracks in the fall, but for the spring meeting look for those coming from Churchill Downs or Fair Grounds. Asmussen has won for a long list of owners but his top owner is William Heiligbrodt. Jockey Ricardo Santana is his ‘go-to’ rider, having ridden more than 50% of Asmussen’s Keeneland winners. He has also successfully used Shaun Bridgmohan, Julien Leparoux, Robby Albarado and James Graham. Two year old debut horses show works 6-7 days apart, at least one from the gate, usually the last work 6-8 days prior to race day. Look for horses that have worked and/or raced 15-20 furlongs within 30 days of race day. Winners have shipped from 8 different tracks, but more than two-thirds have logged their last work at Keeneland. More than half of winners were ridden by Ricardo Santana. Has won for 17 different owners. Approximately half of the winners paid in double digits. More likely to win with turf-to-main surface switches than main-to-turf.